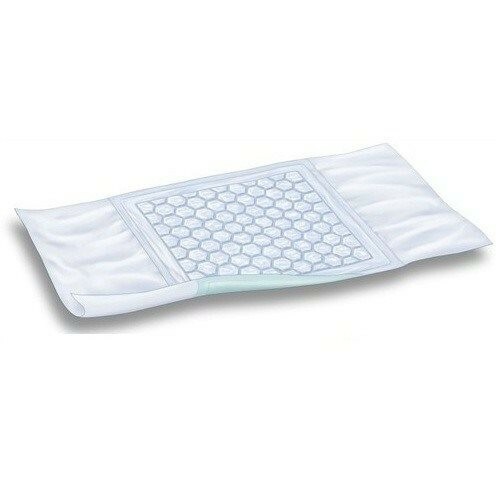 A highly absorbent pad featuring Tuck in Flaps for extra fixation. The Attends Cover-Dri Plus are a highly absorbent pad that fits on a surface. These under pads have tuck-in flaps to protect chairs from fluids, and to provide excess room for fluid leakage. They have been designed for additional protection of chairs, wheelchairs, and other type of furniture. The tucks fold around the seat of the chair and help to keep leaks away from upholstery fabric. They’re particularly effective if the patient is in a reclining position, as that offers additional challenges for wetness protection of beds, chairs, and couches. They can also be used for daily activities, and are suitable for protecting wheelchairs against accidents. The Attends are made in a rectangular shape, with pure white materials so you can tell at a glance if they need to be changed. They have an internal hexagonal pattern that is effective at capturing spills. The hexagonal design will help to give improved protection and faster absorbency. This material is super absorbent to trap liquid in but to keep skin dry. The top sheet of the Attends is designed to feel soft and comfortable against the skin but still provide an effective barrier to wetness that is stored beneath that layer. They have a very soft absorbent material (SAP) which is located within each cushion or hexagon. When the liquid filters inside, it turns into gel, which then keeps it from escaping. The Attends Cover-Dri Plus have a non-slip waterproof backing so they’ll stay in place, even during movement. They also have odour protection to trap odours in, prevent embarrassment, and prevent further development of odours by keeping bacteria from growing. The Attends Cover-Dri Plus work by placing them on the surface of your furniture: beds, mattresses, chairs, wheelchairs, or couches. You may wish to place a blanket on top of the Attends Cover-Dri Plus for a bit of extra discretion. 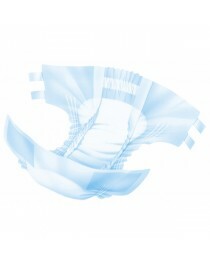 The Attends Cover-Dri Plus are disposable and can be folded up and placed in the bin after usage. 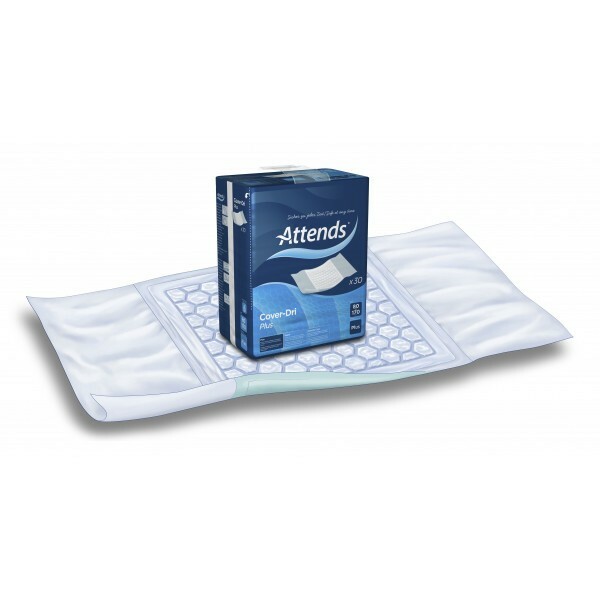 The Attends pads are available in cost-effective packs of 30 in blue plastic packaging. The front width measures at 80cm / 31” with a length of 170cm / 66”. They have a high absorbency level of 1783ml. • Highly absorbent pad for leaks. • Tuck-in flaps for extra protection. • Unique hexagonal pattern to trap fluids. • Soft skin-friendly top sheet.